Great Stay, Realistic Rates! 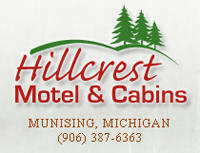 Central to Pictured Rocks National Lakeshore and Hiawatha National Forest, Hillcrest Motel & Cabins offers affordable accommodations for business and leisure travelers. Munising is a four-season destination that travelers return to again and again for recreation and exploration. Conveniently located only 2 miles east of Munising, you’ll be a short distance from the shore of Lake Superior.